The East African SDI Platform for the Urban Poor, popularly known as the East –African Hub meeting, was conceptualized in the context of a growing interest in formulating strategies employed by other fellow Slum Dwellers International affiliates in Africa and the world in general, so as to build relationships among and between the urban poor and their governments, as a way of reaching consensus on secure tenure as well as provide a sustainable and an all inclusive platform to address issues of the ever growing urban poverty indices. Slum Dwellers International (SDI) has inspired continental hub meetings with the aim of building solid and cooperative networks of the urban poor. Through these efforts SDI has helped Slum dwellers federations across the world create linkages with local and national governments, these efforts seek to address issues of urbanization and poverty on a city-wide scale. The 7th East African Hub-Meeting held in Nakuru, Kenya from the 1st -6th May 2012 was attended by delegates and participants from three East African capital cities; Kampala, Dar-es Salaam and Nairobi. The delegates comprised of respective country federation members, The Nakuru Municipal Council, Muungano Support Trust and Muungano Youth Federation. This year’s East African Hub forum discussions focused on the platform of the urban poor in an African context; as far as federation building, housing projects, articulating federation youth Agenda in federated spaces as well as taking firm ownership of the urban poor Fund are concerned. Kenyan delegates from Nairobi and Mombasa spoke about some of the challenges they are facing as far as citywide evictions are concerned. The Community advocacy teams from Muungano wa Wanavijiji gave their encounter of the pains that the urban poor are facing after the Mukuru and Kiang’ombe slum evictions, this irked the federation to conduct profiling of the already demolished urban poor settlements and those earmarked for evictions. Through advocacy and engagement, the federation managed to petition the government and the Kenyan judiciary to put a halt on further evictions. It has not been so rosy, either for the Ugandan Federation since issues of citywide evictions has been a major barrier for the federation to address urban poverty. However, the federation has found a way of addressing this matter by building relationships with their local Authorities. Communities have worked so hard in making the Municipal Councils to understand what they stand for and what is it that they do to make urban poor settlements a safe haven for the poor, though this has not been an easy task. The Nakuru Municipality official, James Gathu , alluded to the fact that most Municipal Council City Policies in Kenya have not at all been tailored with the urban poor citizen in mind, and as a result of this it has been a daunting task for city officials to work closely with urban poor communities that they so often interact with. Though he asserted that this is soon likely to change if more Municipality community led forums, are held so that the Municipal Councils can understand the depth of the matter. The National Ugandan Slum Dwellers Federation, since its formation had consistently sort to engage City officials around water and Sanitation projects for a long time but in vain, but through exchange programmes between the federation and the city municipalities, this enabled the Municipalities to acknowledge the vacuum that exists when you leave out urban poor communities out of the bigger planning picture. These exchange visits and engagements with the federation has seen various Municipal Councils, set aside land for the federation to pilot sanitation blocks projects. In the Tanzanian context, the Tanzania federation has been able to engage Municipal authorities in Dar-es-Salaam and Dodoma and through enumerations the federation identified key project areas that enabled them seek interventions, these efforts has seen them establish Federation in those areas, hygiene promotion and solid waste management, toilet constructions and water projects. Delegates from the three East African federations gave a brief breakdown of how they undertake community housing projects based on the favorable size and design of the house and house cost implications on a member. However, it was noted that the period of time a house will take will entirely depend on the ability of a member to pay the house loan that he/she took from the group to construct the house. i. Normally the size of the house is purely determined by the cost of construction and beneficiaries’ ability to afford paying for it, through diligent savings.  Beneficiaries service their loans at a tune of 5,000KES per month for a period of 8 years. One similar problem kept on popping up amongst federation members is, how“we” reduce the cost of house constructions. Delegates reached consensus that one of the ways to reduce the cost implications, the size of the house as proposed by the beneficiary should entirely be of moderate size. This is likely to utilise less space, hence reducing the cost of building materials. Innovativeness was the next key strategy; to achieve this, federations are tasked to conduct extensive research on modern day house construction to produce building materials, in order to drive down costs. Incremental and house improvements need to be considered as a way of building affordable houses. Federations were also challenged to engage in the construction processes to reduce labour charges. Federations at the Hub Forum shared their local urban poor fund and the structural management of their funds. Kenya’s Urban Poor Fund is the Muungano Development Fund, Uganda’s is the SUUBI fund while Tanzania’s Jenga Fund. As it surprisingly turned out during the presentations, was not necessarily how much amount of monies that slum dwellers pump into such kitties, neither was it how they are managed, nor how best do we utilize the funds in these kitties, but how best can we own up these funds. When do savings become more effective for purposes of empowerment without necessarily taking up loans? Groups that rely on their own savings and leveraging from other sources are more empowering than those federations that depend on loans. Building the capacity of groups to generate their own monies without necessarily limiting themselves to specific financial systems is probably one of the best mechanisms of self reliance. Federations present challenged themselves on the need to invest into the Urban Poor Fund International account(s) and come up with modalities of retaining the shares within the kitty, and not rely on the representation that movements have in the UPFI fund structure. This creates a sense of ownership of the fund by the community members served by the respective urban poor federations. An ordinary federation member needs Food, Water and Shelter. On a larger scale this personal basic needs would influence the member’s savings to realize these needs. But more or less, when trying to transform personal needs into reality, the bigger picture awaits the transformation of our respective settlements. The African Youth form a basis for future leadership structures both at national and Federation level. Based on the evolution of technology the youth are innovating business ideas and initiatives that can be leveraged for federation building. 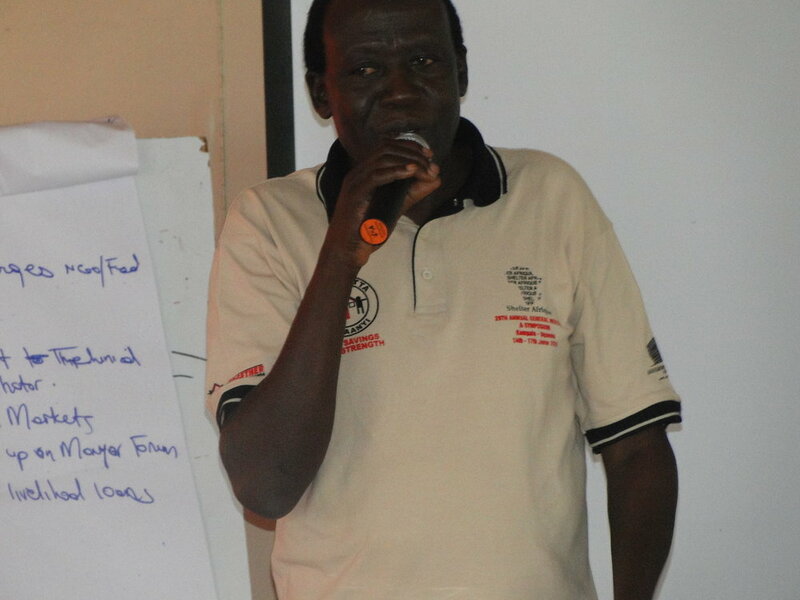 The East Africa Federations agreed that it is important to give the youth a platform to be part of federation building at both leadership and membership levels.“Give the youth an incubation period to allow growth and development within the settlements we live in”. William Kalonji of Muungano Youth Federation Shares insight on the Youth Agenda in federated countries The East African Hub Platform promises diversity in ways of empowering the urban poor by addressing issues of secure tenure, housing projects, water and sanitation, building linkages with government, enhancing advocacy strategies and owning the urban poor fund.